This set includes: data notebook tracking sheet, homework page, and pretest posttest. Studies show that if children practice one strategy for a series of days that their success rate will increase. In my classroom, we take the pretest the week before we are going to start the 20 days of homework. They record their score on their data tracking sheet. 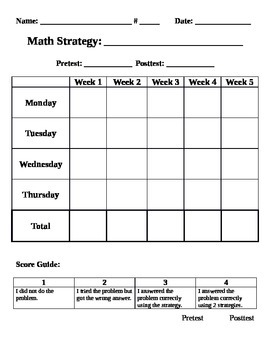 Each day I give the students 1 problem to solve using the strategy that I want them to master. It is important that they only have 1 problem a night. The next day in class, we review the problem and they give them a score 1-4. For them to get a 3, they have to use the strategy that we are working on. They track their scores in the data sheet and add up their total each week. The students should see that with more practice their score is increasing. At the end of the 20 days of homework, they will take the posttest. We follow the Steven Covey Leader In Me program at our school. The data notebook sheet fits perfectly in our Data Notebooks. If you would like an editable version, please look in my store.